On January 24-25, 2019, the Center for the Study of Social Difference presented its final scheduled public workshop in the first iteration of its Reframing Gendered Violence working group. Reframing Transgender Violence was organized by Nash Professor of Law Kendall Thomas and featured scholars, activists, attorneys, and graduate students working across issues of transgender violence and justice. Audience members filled the Jerome Greene Annex at Columbia Law School to hear these speakers give 20 minute presentations and to interact with them in lengthy Q&A discussions, in what was designed as an informal workshop setting to give space to explore the variety of topics being covered. A full video of the proceedings will be made available to the public, and it is the hope of Professor Thomas that these conversations can continue with possible publication of the speakers’ comments, as well. Jennifer Boylan, the Anna Quindlen Writer in Residence at Barnard College, opened our workshops on January 24th by moderating a discussion between Asli Zengin (Louise Lamphere Visiting Assistant Professor in Anthropology and the Pembroke Center at Brown) and Catherine Clune-Taylor (Postdoc in the Program in Gender and Sexuality Studies at Princeton) regarding how we approach the idea of violence against transgender people. Zengin challenged us to see violence as another way of looking at social relations rather than as a binary of perpetrator and victim. Clune-Taylor agreed “about violence as a kind of social relation,” but stated that she also sees “something in terms of how individual bodies are mined for data production” as a form of violence. Zengin emphasized that Turkey, like North America, is quite heterogeneous, and that in both places visibility comes at the cost of more violence. Clune-Taylor avoids intersecting discussions of gender and race because “often there is a distinction made between how intersex communities/conditions are approached in North America (i.e., white populations) and how they are approached in racialized “other” communities,” with the latter often viewed as backward, less advanced. Both Zengin and Clune-Taylor worked to give us a sense that many in this field are working much more capaciously than simply considering accepted tendencies of normative genders. Our speakers discussed the concept of gender for a person as a trajectory that changes over time and emphasized the problem of intersex children having a gender assigned to them at birth. We began day two of our workshops on Jan 25th with two of Professor Thomas’s former “Law and Sexuality” seminar students from 2009-10, Sergio Suiama (Federal Prosecutor in Rio de Janeiro) and Chinyere Ezie (Lawyer at the Center for Constitutional Rights), in conversation with Chase Strangio (Staff Attorney with the ACLU’s LGBT & HIV Project). These speakers led a conversation on the uses and limits of the legal framework for addressing issues of transgender violence, and issues of advocacy and activism for transgender people. Suiama led the discussion with a presentation on transgender violence in Brazil, which has the highest incidences of violence against transgender people, including 868 murders between 2008 and 2016. He warned of increased danger for the transgender community after recent elections, despite 53 transgender candidates running for office in 2018. Suiama shared an especially powerful and disturbing video clip in which Damares Regina Alves, an evangelical pastor and Minister of Human Rights, Family and Women under new President Jair Bolsonaro, calls for “no ideological indoctrination in the classroom” and declares girls princesses and boys princes. Ezie and Strangio had a conversation that brought the problems of existing systems to the fore, with Ezie blaming a “social structure that accepts colonialism as a basis of civilization.” Strangio asked us what it means to look at societal and government structures that have been designed to maintain inequality in the US and elsewhere, citing the example of the US as having a criminal justice system that deals with interpersonal violence by perpetuating state violence (e.g., the state’s ability to incarcerate bodies for the purpose of “protecting” other bodies). 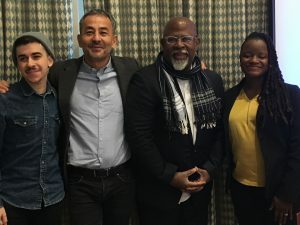 Ezie emphasized that people are too often forced to tell stories that are not their own but rather the easy story to tell, again looking to the treatment of intersex children as an example. How would it be, Ezie challenged us, if we were forced to identify our race on our birth certificate in the same way we are forced to choose a gender? Professor Thomas moderated our second discussion of the day, with Christina Hanhardt (Associate Professor of American Studies, University of Maryland-College Park) and C. Riley Snorton (Professor of English and Gender and Sexuality, University of Chicago). Hanhardt led off with a history of transgender violence, while Snorton asked us to put a “temporal emphasis on history’s own terms” and to understand the ongoing struggle in the present by imaging a future where Black Lives Matter and Trans Lives Matter matter to everyone. Our final discussion of the two-day workshop was led by a presentation on incarceration of transgender people by Joss Taylor Greene, a doctoral candidate in the Department of Sociology at Columbia University. Greene posited that there is a panic about disruption of sexuality identity categories in places like prisons and women’s colleges, tying in many themes covered by previous speakers, including the usefulness and the challenges of opacity with dealing with systems of structural violence. Workshop organizer Professor Thomas emphasized the fittingness of ending our discussions with a dissertation project, as a testament to the “critical nature of continuing this work” on the reframing of transgender violence.